I love Fort Worth, Texas. I want to move there. I love the rolling hills, the tall trees, the cowboys, the horses, the huge ranches, the people. It is all just so wonderful. Mr. 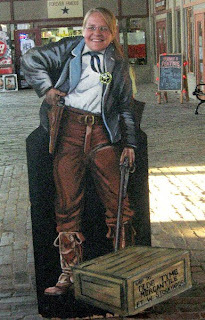 Cowboy and I decided that when we were going to go back to pick up Pearl from her boyfriend's house we would leave the kids at home and stay the night in Fort Worth, Texas. It was a brilliant plan. I loved it, considering Cowpokette will not sleep through the night and I wanted a full night's sleep. The drive there is about 8 hours. That is with stopping for food and gas. We take back roads to get to Fort Worth. That way we avoid big cities like Houston. While we were at a small ghetto gas station, I saw this car. I actually laughed out loud. Do you see it? Fore, it became known unto me that this Toyota was for sale. 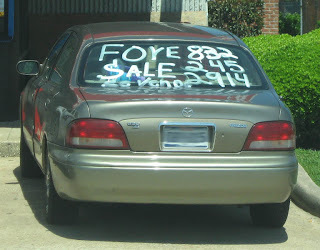 I can't believe nobody told the poor man that was driving this car that he totally spelled "for" wrong. He was with another truck of guys. Not a soul told him. He pulled up to the pump and was fueling up when another car got behind him and the driver started laughing too. I wonder if the man sold his Toyota? 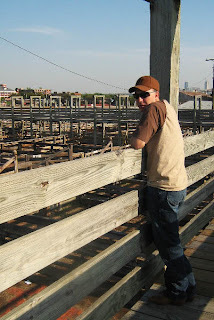 Well, anyway, we finally made it to the Stockyards in Fort Worth. I was so excited. I have heard so much about them. How there was shopping, food, shopping, more food. Oh, my two most favorite things. Here they are. 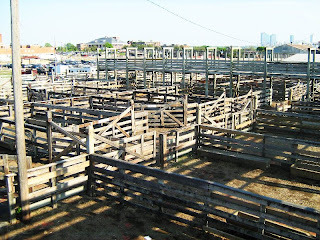 The stock yards. I was kinda disappointed that there wasn't any livestock in t he pens. But I was informed that they don't really use them anymore. I also noticed that the floors of the pens were brick. Now that isn't really practical footing for livestock. That is very slippery when it is wet. Here is Mr. Cowboy looking too cool for my picture. I embarrass him. But too bad. There is a cattle drive down the main "drag" twice a day. They moooove a hand full of longhorn steers. When the steers are not being driven they all hang out in a large pen. This one steer was funny. It just stood there. It was the only one with a bell on it's neck. I wonder if that one likes to wonder into the crowds while being driven down the street? The Stockyards have a bunch of different steak houses there that you can eat at. We unfortunately did not get to eat at any of them because we got there at 6pm and we wanted to go to the concert and rodeos that were that night. There were motorcycles everywhere. They were so loud. It is fun how everyone gets in their trucks and on their bikes and they would cruse down the street, then turn around and do it all over again. I had the most fun just walking around and browsing the shops. Watch out y'all there is a new sheriff in town. Mr. Cowboy refused to put his head there for a picture. I guess I could just photoshop his face over mine. Hmmm...it is a thought. 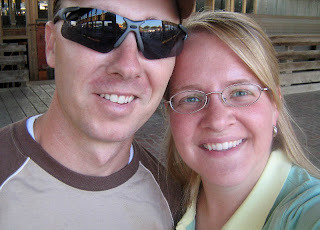 After I was finished embarrassing my husband we headed over to see Blake Shelton and Montgomery Gentry in concert. It was a free concert so, you could stand anywhere. 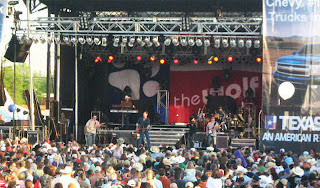 We started out in the back and then we ended up almost at the stage by the end of the Montgomery Gentry concert. It was really good!! We were far away from Blake. 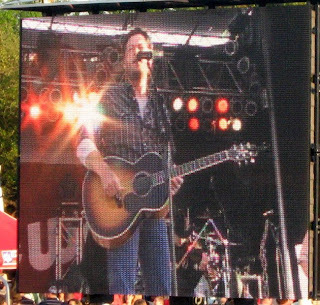 So, I watched him on the big screen. The concerts were great! Chevy Thunder put on the shows and had their NASCAR cars there for everyone to drool over. We had a good time. We even went to a rodeo. Where we ate dinner. How sad, we were right there next to some of the best steak houses and we ate rodeo hot dogs. But while we were at the rodeo we got to see Tuff Headerman's two boys rope. Tuff is a famous bull rider. He was Lane Frost's best friend. Tuff started the PBR, Professional Bull Riders. Mr. Cowboy would have loved to have ridden in the PBR, but he was injured and now has three metal plates in his face and pins and rods in his leg. He walks like an old man. So, no more bulls for Mr. Cowboy. 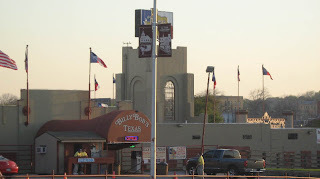 Here is the famous Billy Bobs. We did not go in. BB Kind was playing that night. But come on. Who could pass up Montgomery Gentry. After the concert ended it was about 11 pm and we were both really tired. 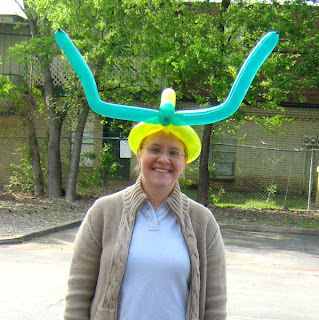 On our way back to the truck we found a clown that was making balloon hats. This is the one he made me. See, I can fit in in Texas. 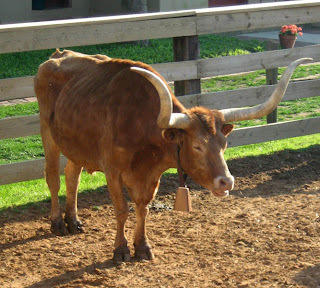 I am a long horn. Again, I embarrassed Mr. Cowboy because I wore this balloon hat for the rest of the evening and all they way to our hotel. He didn't get a cool balloon hat. I tried to get him to have one made and to wear it over his cowboy hat, but no luck. Oh, well. I guess someone has to be the mature one of the group. I had a great time. I can't wait to get a chance to go back. OMG men never stop do they? 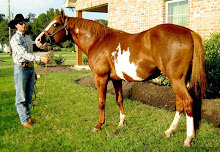 Mine wants to start riding bulls again after he saw an old timer come out of retirement and win last year. Nevermind the fact his lower leg is plated and screwed together. I wish he would just concentrate on raising them and having them ridden by others...he doesn't need to try out each year's crop himself. You guys looked like you had a blast. I keep pushing for a LONG 'weekend' away that doesn't actually involve working a rodeo...or working. I didn't know you guys went and did this. Sounds like so much fun! Though I can't believe you passed up all those steak houses. Yum. So who had the pleasure of not sleeping through the night while you were gone. Hee hee. Sounds like a fun trip! I think I've heard about that cattle drive on tv once. Do they take them right through town? I'd love to visit Tx sometime. I've only driven through but my husband has alot of family there, but can't think of where now,lol. 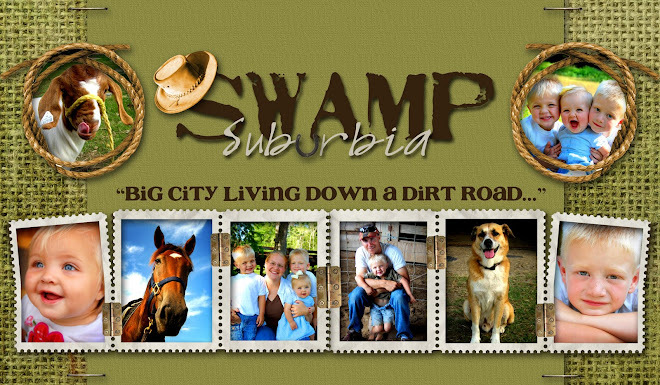 I am a transplanted city girl to the swamp lands of Louisiana. Trying my best at raising my cowpokes and keeping my head on straight. Have somethin' you want to tell me? Just drop me a line! Try these, they are the best!! Come and visit our Farm! As Big as a House! 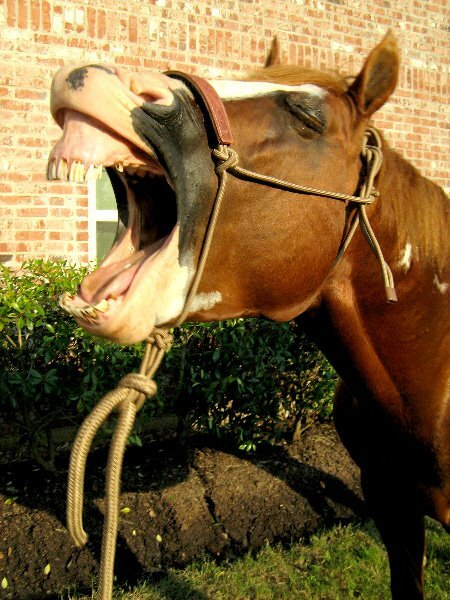 I got it straight from the horse's mouth!